The Portland Sea Dogs dropped another game to the Binghamton Mets 4 - 1 Tuesday night. The Boston Red Sox held on, then added insurance runs against the Yankee bullpen, finally beating the Yankees 7 - 3 at an empty New Yankee Stadium. 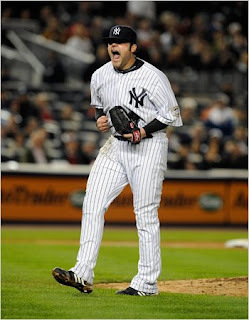 Special thanks to Joba Chamberlain for re-igniting a blasee Yankees Red Sox rivalry after plunking Jason Bay square in the back. Bay had ealier hit a HR of Bay, and right before the beaning, lost David Ortiz who walked. Thanks Joba...Thank you very much. Tonight will be a very busy remote control night in New England. The Boston Red Sox open a series at Fenway against the Cleveland Indians at 7PM on NESN +. NESN + can be found on the following stations DirecTV Channel 629(SD), 629-1(HD), Time Warner Cumberland and York Co. Channel 22(SD) and 522(HD), Time Warner Bangor Channel 12 (SD) No HD, Comcast Channel 81 (SD) no HD and Oxford Networks Channel 31 (SD), no HD. The Boston Bruins will start Game 3 against Carolina Hurricanes at 7:30 on regular NESN Channels and the Boston Celtics will start Game 2 of the 2nd round series against the Orlando Magic at 8PM on TNT. Make sure you guys have extra batteries and all supplys needed for multiple game viewing. FYI MLB TV.com has Sox coverage, so those with laptops or computers near your TV can watch all 3!